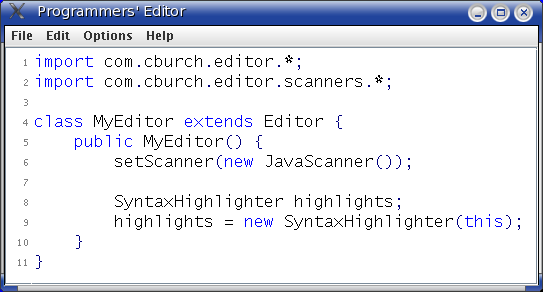 This library of Java 5.0 classes implements an editor with syntax highlighting, parenthesis matching, automatic indentation, and line numbers. It helpfully points out unmatched braces, and hovering your mouse over an erroneous token can give a helpful tool tip explaining the problem. The library is a programmer's editor in three ways. 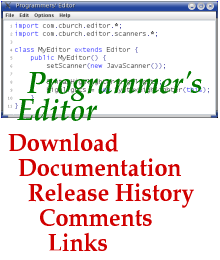 The demo is itself a passable programmer's editor, including most of the important features common to such editors. But really, the demo's not the point. The classes serve as a useful library for programs that need a text editor as an important component. Configuring it to work with other languages requires little more than writing a new file for JFlex describing the tokens in that language with regular expressions. The code itself is open and thoroughly documented, usefully illustrating how to implement the features. All is built on top of the javax.swing.text package. The com.cburch.editor package is free software; you can redistribute it and/or modify it under the terms of the GNU General Public License as published by the Free Software Foundation; either version 2 of the License, or (at your option) any later version. The com.cburch.editor package is distributed in the hope that it will be useful, but WITHOUT ANY WARRANTY; without even the implied warranty of MERCHANTABILITY or FITNESS FOR A PARTICULAR PURPOSE. See the GNU General Public License for more details.